DO-01033-55 was succesfully added to your cart. 0.1 mg to 0.01 mg.
Electronic Balance Weights can be used to check or verify the accuracy of your balance and/or scale between calibrations. It is recommended that the user check a balance and/or scale prior to each use. Keeping the weight at or near the balance and/or scale keeps the weight at the same temperature as the equipment.To get all the accuracy your electronic balance and/or scale provides, you need to perform routine calibrations and verifications using precision calibration weights. 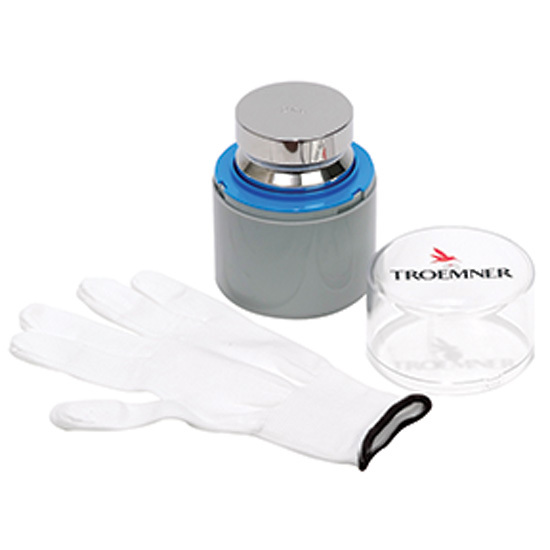 Troemner’s Electronic Balance Weights are intended for this purpose. Electronic Balance Weights are ideal for non chemical environments to verify balances or scales.Manufactured from stainless-steel chosen for its uniformity density, high resistance to wear and corrosion, and low magnetic properties. These individual stainless steel electronic balance masses are designed for calibration of electronic balances and routine weighing applications. The larger denomination electronic balance calibration weights (5 kg and up) have a recessed stainless steel grip handle for easy handling and stacking. Smaller denominations (2000 g and lower) are cylindrical in shape with the heavier of these having a groove near the top for easy gripping. Individual weights 10g through 10kg are supplied in a high quality polycarbonate case, a nylon glove is included to protect weights during use, all weights include noted documentation of accuracy from the vendor.